The twenty-first century is initiating a new lifestyle among nations. Persons of all backgrounds are communicating through the Internet. Friendship and understanding between diverse cultures are thriving. The Alexander S. Onassis Public Benefit Foundation is inspiring the learning of the Greek language and literature among international scholars. I was awarded a teacher training scholarship for the academic year 2002-2003 for two months in Athens, Greece. An excellent Modern Greek language program at the Hellenic American Union in Athens provided an outstanding basic teacher training program. The A.S. Onassis Foundation sponsored my attendance at the 9th Psychological Conference in Rhodes. I had the unique opportunity of reading primary and secondary sources on Cavafy, Seferis and Kazantzakis at the Gennadius Library. Athens has outstanding museums, art exhibitions and a unique Athens Festival at Likavittos and the Odeon of Herodes. Persons make up a city. The following individuals were interviewed: Chris Spirou, President of the Hellenic American Union; Professor Christophoros Charalambakis of the Philology Department of the University of Athens; Mrs. Loula Alafoyiannis, international leader and president of Euro-American Women’s Council (EAWC); Francesco Vitali, international artist; Lila de Chaves, Ethnologist and President of the Greek Federation of Friends of Museums; Dean Dr. Nikitas Polemikos and instructor Stacy Polemikos of the University of the Aegean. The cultural, educational activities and communication with the Greek community enriched my knowledge of Modern Greek language and culture. St. John’s University has wireless Internet access. Incoming freshmen students are required to have a laptop computer. Instruction and communication is through the Internet. 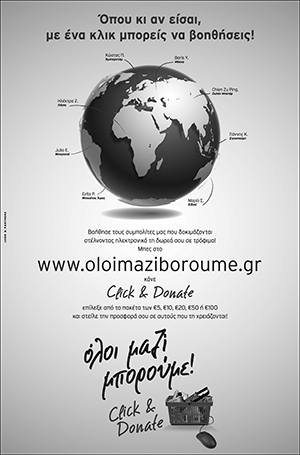 An Internet site was created to inform the Internet community of the Modern Greek language and Literature Program. My work as an Alexander S. Onassis Public Benefit Foundation scholar will be added in a folder entitled “Alexander Onassis Scholarship”. The website can be accessed at http://facpub.stjohns.edu/~tsounisc Digital albums on the yahoo.com site are open for public access. Articles will be published on various culture events and interviews with prominent persons. During the months of May through July, I completed intermediate and advanced Modern Greek courses at the Hellenic American Union at 22 Massalias Street in Athens. The Hellenic American Union began its Modern Greek Language Program in 1957. It is the oldest center offering Modern Greek language instruction in Greece. The program is offered at five levels of competency. My instructors, Christina Paraskevopoulos and Kiki Segertzes exemplified the finest traits of a language instructor: understanding of the language and empathy for the student’s needs. All instructors are graduates of Greek universities. They hold a BA in Greek language and literature. The instructors have taken courses in foreign language teaching and trained to teach Greek as a foreign language. Instructors reinforced concepts in Greek Grammar. I submitted daily compositions based on literature, current events, museum visits and the 9th Psychological Conference in Rhodes. My errors in Greek grammar were analyzed. New spelling and grammar rules were introduced. The concept that one must think and express oneself in Greek is reinforced. In the Intermediate courses, basic grammatical structures are taught. Use is made of selected passages in Greek literature. Advanced Modern Greek classes deal with complex academic lectures and theatrical works. Extended discussion on a wide range of professional and specialized topics. The textbooks utilized included: Εποικονείστε στα Ελληνικά -levels 2 and 3 and Νεοελληνική Γραμματική. Class size is small. Every student gets to know each other and the instructor on a personal basis. The Hellenic American Union held various exhibits and workshops. An exciting artistic event was Apostolos Koustas “Vrahografies”exhibition from May 12th to June 4th. Two rooms featuring large cement slabs and oil on canvas paintings with prehistoric engravings make an impression on the spectator. An exciting video showing his artistic method with music composed by Mr. Papadimitriou giving the onlooker a feeling of his art. The exhibition of Apostolic Goustas refers to prehistoric frescoes and engravings in stone. His theme is the dawn of Word and Gesture in the prehistoric Age. Koustas believes engraving gives order to chaos and light to darkness. His work refers to man’s early attempts to speak about his person, placing himself in a material environment, in a way he himself desired. The artist resides in Messolonghi. He is the recipient of the International Isaka Engraving Triennale award, distinguishing him among 1748 artists from 67 different countries. The Alexander S. Onassis Public Benefit Foundation sponsored my attendance at the Ninth National Convention on Psychological Research in Rhodes from May 21st-24th. Professor Nikitas Polemikos, Dean of the School of Humanities of the University of the Aegean played a major role in organizing this successful Convention with colleague, Professor Maria Kaila, vice rector of the University of the Aegean, Chrysa Mavridou, Paraskevi Atzemi and others. Over two thousand, five hundred persons attended from Greece and countries of the European Union. More than one hundred workshops were offered. Leading Psychologists who attended and were honored included Dr. James Georgas and Dr. Ioannis Paraskevopoulos. Prominent political leaders, intellectuals, members of the businesscommunity and college students attended. This writer was impression with a harmonious Turkish presence from the University of Izmir. Dr. Polemikos said, “there was a University in Izmir before the University of the Aegean was established.” A representative of the College Association of Turkey located in Ismir, explained, “it is my pleasure to work with the University of the Aegean on this Conference. I look forward to developing closer ties in University affairs with both our countries. Later in the week, a television program from Turkey was televised showing Turkish folk dancers performing and singing the basic Mikrasiatica songs and dances sung by Glykeria and Yiorgos Dalaras. Professor Christophoros Charalambakis, full professor of Linguistics of the University of Philology, in an interview stated the “European Union has a crisis of self identity. From one point, it wants a multicultural, multilingual society. In reality, the language that will exist will be English, German, Italian, French and Spanish. Other languages are in jeopardy of being overwhelmed. Eventually, the extension of the European Union will lead to only five major languages being utilized. We must face this reality; I support the obligation of every European citizen to be proud of his mother languages and learn to speak it perfectly. Learn English as a second language. Knowledge of one of the four leading languages and a minor language of the European Union should be encouraged. This is the obligation of a multi-lingual European.” Dr. Chralanbakis, who was educated abroad, exemplifies the new wave of international professors emerging on the scene of the European Union. The Gennadius Library has an international reputation for being the receptacle of world masterpieces. I engaged in research of Cavafy, Seferis and Kazantzakis, fulfilling a dream of visiting the Gennadius Library. This was made possible by the Alexander S. Onassis Public Benefit Foundation scholarship. Kazantzakis’ accounts of his travels as a journalist are difficult to find in the United States in Greek and English. I was able to find in Greek his encounter with a Japanese Christian/Samurai. The passages will be incorporated into my curriculum, in Greek and English. Kazantzakis’ observations 100 years ago still have truth today. Our University has an Asian population interested in Greek and English sources by Modern Greek writers. These passages will be of interest to them. Cavafy is probably the most popular Greek poet in the U.S.A.. Jackie Onassis’ love for his poetry has inspired interest among the American public. The Gennadius library has a vast compilation of his masterpieces. Reading Edmund Keely’s works added a new perspective to my image of Cavafy, and Seferis’ works gave me an insight into a man without a country, who loses his ancient homeland of Smyrna to the forces of power politics. A bibliography of the three writers is added to my research paper and to my Internet site. Being in the same room with masterpieces of the 12th century- 21st century was a moving experience. The Gennadius Library is an important site for every individual interested in Modern Greek literature. A list of links of persons and places has been compiled. Persons visiting Greece should access my links to get an insight on all aspects of Greek life. Francesco Vitali, international artist, gave me an insight into the theatrical world with his explanation of his role as the new “Rudolph Valentino”. The artist explained, “I am trying to present a positive image to the international community of the modern, sophisticated Greek who can perform all roles.” Lila de Chaves, Ethnologist and President of the Greek Federation of Friends of Museums, described her mission to enrich the museums of Greece. “Museums enrich our country and present to the international community the achievements of Greek civilization from Ancient times to 2003.” Prof. Theodore Couloumbis, Director of Eliamep offered his substantive support in my research. The cheerful disposition of Dolla Kotsifakis, Chryssa Brazioti, Evi Dellatola and Eleni Sarri aided my work at Eliamep. Athens is an international cultural center. The Holy Rock of Athens, the Acropolis, was visited. The Kerameikos was closed for renovations. Walking through the neighborhood gave one an insight into the ceramics industry. The Sanctuary of Dionyssos, Temple of Olympian Zeus, Areospagos, Philopappos Hill, Adrian’s gate, Plaka, the Greek Parliament, Monastiraki, and Psirri were some of the landmarks visited. Τhe National Art Gallery is presenting a unique exhibit on “Theatrical Costumes”. Two hundred and fifty unique costumes from the wardrobe of the National Theater are exhibited. These costumes were created from 1940 to the present time. The visual artists include Vakalo, Tsarouhis, Moralis, Vassiliou, Ghikas, Mytaras, Fassianos and others. The theater costume designers are Fotopoulos, Patsas, Petropoulos, Metzikof and others. This unprecedented exhibition is part of the Cultural Olympiad. The Benaki Museum is the history of Greece. Its extensive Greek collections define the nature of Greek civilization. The wealth and quality of its distinct collections on Islamic Art, Chinese ceramics, Children’s games and Toys are unique. It is the first Greek Museum created by the vision of one person, Antonis Benakis, of a historic family of the Greek Diaspora. Megaron Mousikis is offering two exhibits on “Faces of Egypt, from Giza to Fagium” and “The new valley of Nile”. The sculpture, ancient items and portraits of Fagium are impressive. The Cultural Olympiad and the Museum of Cycladic Art presented the exhibition “Sea Routes.. from Sidon to Huelva”. Twelve hundred artifacts of the late Bronze and Early Iron Age of silver, bronze, iron clay and various stones and glass were shown. Greece, Cyprus, Lebanon, Syria, Italy, including Sicily, Sardinia, the Vatican, Malta, Spain and Turkey. The exhibit succeeded in showing the communication and cultural interaction between the Mediterranean peoples. The National Historical Museum stands out as a tribute to the persons who forged the Modern Greek nation. Greek flags, weapons, woodcarving, oil paintings, costumes, gives one a feeling of the era. The Byzantine and Christian Museum gives one a glimpse into the world of Byzantine Art. Ilias Lalaounis Jewelry Museum has an exciting collection inspired from astronomy, technology and biology. Biosymbols, motion in space, choreographism, drops and chitons were shown. The Greek jewelry from ancient times gave one an insight into contemporary jewelry. The War Museum impressed me with the exhibit of “El Alamein” in W.W. II. The heroism of the Greek army to fight on in the desert and prove “heroes fight like Greeks” is distinctive in history. The War museum shows the spectator heroism, bravery that is only Greek. The “Festival Athinon” presented dramatic renditions of the Opera “Samson and Delilah” and Mikis Theodorakis “In Memory of Yannis Ritso” that was breathtaking. Seeing performances in this unique Ancient Greek Theater gave me a feeling for the ancient and Modern Greek culture. Walking up Lycavittos and seeing the splendor of Athens with a backdrop of the Acropolis is unforgettable. My cultural activities ended Thursday evening, July 11th, at Lycavittos attending Glykeria and Thalassino’s performance of “Symrneika”. The tunes brought back memories of my grandfather whose family was from Smyrna and Kordelio. This unique two-month scholarship made me realize that Greek language and culture must be preserved in America. My insights and Internet site will reach out to Americans of all backgrounds that Greek is unique. Our second and third generation Americans will understand the Modern Greek of 2003 through my writings and Internet site visits. The Modern Greek citizen showed friendship and assistance to me as a visiting pedagogue. My memories of Greece are of the people, whose sincerity and kindness will remain with me.